Jack, in the children's fairy tale “Jack and the Beanstalk,” imagined that there was another world above the clouds. Ancient peoples speculated about the unknown worlds in the night sky. Today, when we feel anxious or uncertain about life, we often are emotionally affected by stars shining in the night sky. There is in this universe something that reminds us of the mystery of nature. Starting out as fantasy, astronomy evolved into a science that has explained the mysteries of the movements of the moon and planets, proved that the sun is a star in a galaxy, just like other stars shining in the night sky, showed that there are innumerable galaxies in the universe, and continues to explore toward the edges of the universe. The origin of the universe, which used to be explained only in terms of theory, has become a major object of astronomical observation, and discoveries of planets outside the solar system are no longer treated as major headline news. Astronomy covers a wide range of phenomena. The universe is born. Stars and then galaxies form out of cooling gas. Planets begin to orbit stars. Some stars are born, while others disappear after a period of evolution. All of these processes are covered by astronomy. As seen from the fact that it played a role in verification of the general theory of relativity, astronomy is closely related to physics, but it is also supported through cooperation with several other fields of science (for instance, knowledge of chemistry is needed to understand the gas cooling process). If we consider that in the universe there are searing heat and super-high vacuums that cannot exist on Earth, it becomes credible that there still may lurk physical laws beyond our current understanding. Astronomy is valuable in that it is a science of extreme states. Recently, astronomy has progressed very rapidly. 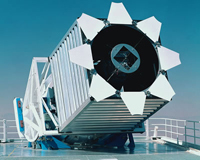 With the remarkable development of computers, CCD cameras and other technologies, observation by means of large telescopes and satellites has advanced dramatically. Many new observation devices, telescopes and satellites are being planned. New observation equipment will open up new fields and evoke new theoretical inquiries. Ten years ago, the Department of Astronomy was located in an enclave near the Hongo campus. Now, most of the staff have moved to Science Building 1 behind the Yasuda Hall. Perhaps because astronomers like high places, the Department occupies the top floor. The rooms in the 10-year old building are still fresh. The Department of Astronomy faculty numbers only 10 members, making our Department one of the smallest in the Science Faculty. We play a central role in astronomy education and research at the University of Tokyo, thanks to the cooperation of staff members of the Institute of Astronomy in Mitaka, the Department of Physics, Graduate School of Arts and Sciences, National Astronomical Observatory of Japan, and JAXA Institute of Space & Astronautical Science. We admit only around 10 undergraduates each year, which enables closer interaction between students and greater work satisfaction. The master's course admits around 20 students every year, of which at least 10 carry out leading edge research and go on to earn doctorates. More than half of our doctoral graduates find positions as astronomy researchers. Thus, we make a very significant contribution to the development of astronomy in Japan. There are only a handful of astronomy departments in national universities. It is regrettable that education in astronomy for undergraduates is available only in a small number of universities. We are proud of our ability to provide astronomy education that is not available at any other universities. As I mentioned, astronomy is closely related to physics. So, any intending astronomy student should diligently attend physics lectures during his or her undergraduate studies. There are also lectures that provide basic knowledge in astronomy. Among these are lectures on celestial mechanics and positional astronomy, which are seldom available even in graduate schools. Because the lectures are also very useful in other fields, they attract students from other departments. Third-year students can select lectures in which they observe stars using telescopes. Some groups visit and stay at the Astronomical Observatory in Kiso. In the fourth year, students are assigned research projects. They are supervised by faculty members and take part in frontline research observations. Their research projects frequently develop into academic papers. It is exciting that undergraduates are able to be involved in such frontline research. If you go on to the graduate school, you may have an opportunity to use the 8.2-m Subaru telescope on the top of a mountain in Hawaii, or to travel to the highlands of Chile to conduct observations. In the past, it was said that astronomers lived in a vacuum. That has changed (in my opinion). At least, the faculty members I know appear to lead normal lives. More than 80% of undergraduates go on to the graduate school, but some decide to pursue apparently more steady occupations after they obtain a BSc, MSc or PhD. The places of employment range widely, from computer or optics manufacturers to financial institutions. Many of those who set their sights on research become post-doctoral fellows after obtaining a PhD and go on to perfect their education and careers. Recently, an increasing number of our doctors have secured posts in overseas universities and institutes. Astronomy has a long history and embraces a wide variety of fields. Even a superhuman student could not possibly study all the available areas. Although it utilizes theoretical and observational methods of research, astronomy essentially is an experimental science. Recently, however, observation has become digitized and more accessible to theorists. Accordingly, the number of theorists who observe is increasing. In our course, world-leading research is carried on in many fields, including galaxy evolution, interstellar matter, supernovae, oscillation of stars, the Sun, etc. The greatest challenges for astronomy today are exploring the history of the universe and investigating the origin of our solar system. How did the universe begin with the Big Bang? How were stars born? How were galaxies formed? The galaxy group in our course (Okamura/Shimasaku Group) tackles this huge mystery. In cooperation with groups in the United States, they observe all visible galaxies and investigate the galaxy evolution process, using large amounts of data. They also use the monster CCD camera attached to the Subaru telescope to observe a number of galaxies in order to shed light on the history of the universe. Figure 1 shows a 2.5-m telescope in the United States, used for whole sky observation. 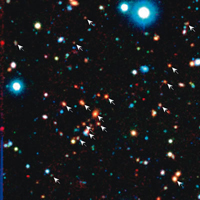 Figure 2 is part of a recent doctoral thesis, a visible light image of distant galaxy clusters taken by the Subaru telescope. A galaxy cluster is a group of galaxies. In this image, galaxies in clusters are marked with arrows. The large blue dot represents the stars of our galaxy, which are not directly related to this research. More often than not, galaxies are grouped together. This research focuses on how grouped galaxies evolve in a cluster and seeks to gain an understanding of the growth of galaxies in the universe. For observing distant galaxies, the use of infrared radiation is said to promise more exciting possibilities than use of visible light. This is because light from distant galaxies is redshifted into infrared radiation due to the expansion of the universe. However, infrared radiation is more difficult to observe than visible light, particularly infrared radiation whose wavelength is longer than 1/100mm because the atmosphere interrupts it. Hot objects emit infrared radiation. If observation devices are hot, they will also emit infrared radiation and interfere with observation. For this reason it is necessary to cool observation devices using liquid helium (whose temperature is around -270 degrees C). To avoid interference from the atmosphere, well-cooled telescopes are launched using satellites. The Onaka Group is conducting infrared radiation observation both from satellites and from the ground. 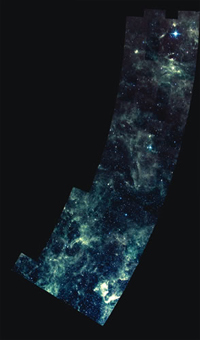 The cover image shows the Large Magellanic Cloud, the galaxy adjacent to ours, captured by a camera on-board the satellite AKARI, which was launched in February 2006. There is minimal dispersal or absorption of infrared radiation because of its long wavelength, and we can see what is happening in the galaxy without our view being impeded by objects that lie in between. Data that show in detail what is happening across the entire galaxy help us to understand how stars are born and die in the galaxy nearest to our own. 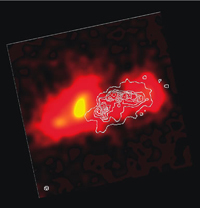 Figure 3: Infrared image of a dwarf galaxy taken by the Subaru telescope (utilizing the mid-infrared instrument on-board the Subaru telescope). The contour lines show the same galaxy as seen via visible light. The bright section represents the invisible area known as a “buried super star cluster,” where many stars are born. Because heavy telescopes cannot be loaded on-board satellites, larger units are ground-mounted. Large telescopes are warm and less sensitive than the cooled types of on-board satellites, but they provide much higher spatial resolution. Figure 3 shows a high-resolution infrared image of a small galaxy taken by the Subaru telescope. The contour lines in the image represent the galaxy as seen via visible wavelength light. Surprisingly, the galaxy seen via infrared radiation appears completely different from that seen via visible light. This is because there is no intermediate obstruction to the infrared radiation, as mentioned above. The very bright section in this image is an area called a “super star cluster” in which an enormous number of stars are assumed to be born. However, how such a cluster is formed remains a mystery. Our Earth is a warm planet, and is very bright in the infrared. Infrared observation from the ground is best suited to studying how a planetary system is formed around a star. On the back cover, there are two recently taken infrared images: materials floating around a newly born star and a celestial body on the brink of extinction. Around the newly born star are floating materials which may become planets. The decrease in quantity of such materials closer to the star suggests the presence of a planet. On the near-extinct celestial body, there is known to be a distribution of organic materials (shown in red) comprising a large number of benzene rings clustered together. Why there are materials that have benzene rings is still a mystery, but the manner of distribution suggests that the organic materials would have been there for a long time. Such organic materials are known to be distributed throughout the entire galaxy. Observation using infrared radiation is key to monitoring the development of organic and other materials. The development of computers has contributed greatly to progress in numerical simulation of celestial bodies. Gamma-ray bursts, in which gamma rays burst for seconds or for hours, were discovered more than 40 years ago, and have been one of the greatest mysteries in astronomy. Recently, it has been learned that the kind of gamma-ray burst known as a long burst, in which gamma rays burst for longer than 2 seconds, can be caused by a hypernova explosion, whose scale is more than ten times as large as that of a supernova explosion. 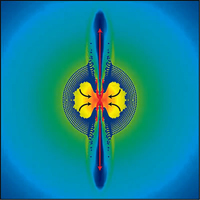 The Nomoto Group conducts simulations of such explosions in order to investigate the origins of the elements of the universe. Figure 4 shows an example of such simulation. Jet injections are faithfully simulated. The Shibahashi Group investigates the cores of stars utilizing “starquakes.” Transmission of seismic vibration in a star depends on its density, temperature, etc. So, what is happening within a star can be learned from how seismic vibration is transmitted. As shown in the figure on the back cover, starquake studies are most advanced in respect of the Sun, but they are now also being conducted on other fixed stars. It is no accident that people commonly use terms like “astronomical figures.” The subjects of astronomy are massive and change over very long periods of time. The Yoshimura Group studies changes that have taken place in the size and brightness of the Sun over periods ranging from generations to tens of thousands of years, by digitizing photographs of the Sun taken over period longer than 100 years and analyzing such digitized photos. Figure 5 shows valuable photos being digitized in a clean room. Astronomy is now at a major turning point. The large-scale adoption of digitization means that huge quantities of data are being delivered daily. Large telescopes are progressively being built, while construction of large radio interferometers has begun. Larger satellites are being planned. Sophisticated observations using various wavelengths are being conducted. Soon, we will be able to learn more about the extremities of the universe and the planet systems adjacent to ours. Numerical simulations have become more accurate, supported by developments in computerization, and verification of simulated data against observed data is advancing. Astronomy, which has historically dealt with “astronomical figures,” is becoming a high-precision science, which attaches importance to fractional parts. If you aspire to becoming an astronomer, your future is very bright because you will have opportunities to enjoy extremely interesting and significant research activities.